Both federal and state law prohibits discrimination against those with disabilities, both in the employment setting, and the public accommodation setting. This means that most businesses are required to take certain steps to ensure that disabled individuals have reasonable access to their property, which includes allowing them to use service animals. What Qualifies as a Service Animal? Preventing the impulsive behaviors of those with psychiatric disabilities or neurological problems. The law does not consider the provision of companionship or comfort to be a covered task under the ADA. Currently, the ADA only recognizes dogs as service animals. Other kinds of animals, even when specially trained, do not satisfy the definition. Florida law, on the other hand, allows dogs as well as miniature horses to qualify as service animals. Denied housing because of the animal. What tasks the animal has been trained to perform. 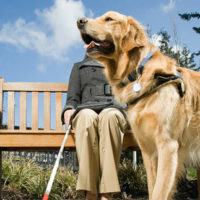 However, property owners cannot even make these inquiries if it is readily apparent that the animal was trained specifically to help an individual with a disability. Individuals who use service animals have certain rights and cannot be excluded from public places. If you are disabled or are a business owner who wants to learn more about the ADA, contact Saady & Saxe, P.A. Attorneys At Law by calling 813-909-8855 to speak with a knowledgeable Florida attorney who can evaluate your case.